25 years ago today (14th February) Ireland and Scotland took to the rugby field for the first time. Rugby historian Lydia Furse reports. Edinburgh, Valentine’s day, 1993. The day was one of those rare February days in Scotland that did not start with rain. This is not what defines the day in history, however, as this dry day saw the first Scottish and Irish women’s rugby teams compete in both countries first international at Raeburn Place. Ireland had travelled and had a lot to prove, but it was Scotland who took the honour of winning the inaugural match in front of a crowd of over 1,000 people, with two tries from scrum-half and captain, Sandra Colamartino. The final score was 10-0. This game was commemorated a week ago with a get-together to co-incide with the start of the 2018 Six Nations. The anniversary event was organised by Kim Littlejohn, who captained Scotland from 1993 through to 1998. In the traditional fashion for women’s rugby, it was not an official event put on by the governing body, although messages of support were heard from both the Irish Rugby Union and the Scottish Rugby Union. As many of the original players and coaches as possible were invited and some even travelled from New Zealand to attend, which resulted in a fantastic night of reminiscing and celebrating. Held at The Raeburn, a hotel conveniently located on the edge of the pitch which 25 years ago had been the site of this historic match, the night replicated the post-match socials of international rugby matches, with a fantastic camaraderie between both teams as they sang the night away. 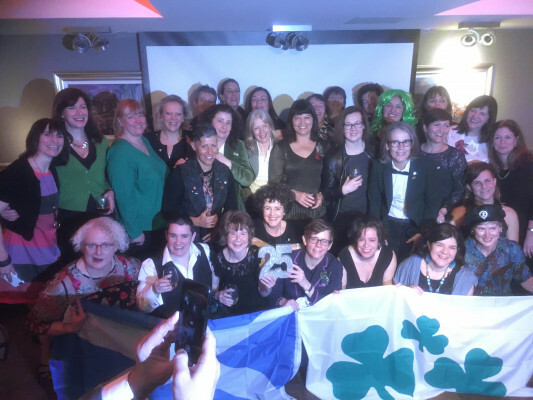 Speeches were made by Kim Littlejohn and the two captains from 14th February 1993, Sandra ‘Gnomie’ Colamartino (Scotland) and Jill Henderson (Ireland). As each of the women spoke, the gathered crowd experienced a full range of emotions: pride, joy, excitement, sadness, and awe, as this event put their actions of 25 years ago into perspective. The overriding comment was that at the time, everyone did it because they loved rugby, and wanted to play at the best level that they could. It took this celebratory event to really cement in the minds of these pioneers the significance of their actions. Conversations on how far the women’s game has progressed in just a quarter of a century revealed the pride these players felt in representing their countries and being at the forefront of this fantastic sport. It also showed some of the obstacles they had to overcome in the early days, such as rugby kits only coming in male sizes, as the photo of Joanne Moore who played fly-half shows! Let’s hope that more events such as the Irish v England Legends game back in the 2017 world cup, and celebrations of such important anniversaries will continue to be organised to help the ever increasing number of girls and women playing rugby understand the role of these women who ultimately, just wanted to play the game. Team photos and programme with thanks to Scrum Magazine. All games: Played 26, Ireland 12 wins, Scotland 14. Biggest win for Ireland: 73-3, Broadwood Stadium, Cumbernauld, 2015.